Here preaching to the masses. Get out and vote boys! I'm afraid Cruz may be in trouble Vote! They sent me a text yesterday asking who I was going to vote for. I asked them” which one supports President Trumps America First agenda “ No response . Beto.....that mexican pandering nickname makes me wanna hurl. Me too. All the libs are fired up, of course. But I am seeing a lot of Trump voters still hating on Cruz and talking about voting for Beto. It'll sure be a crying shame if a guy like Beto beats a guy like Ted Cruz in Texas. Stick a fork in us if that's where we are as a state. Same here. 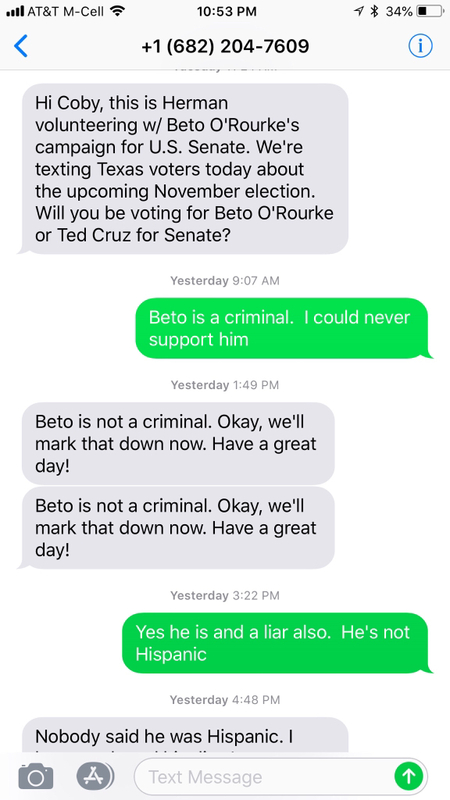 I told them I don’t vote for criminals. If we get out and vote he won’t stand a chance. All depends on the turnout. He has no message of any substance and avoids discussing policy. If enough people fall for that crap then God help us all. Go Ted Go. Two people just knocked on my door preaching for the guy. Told them thanks for their time but going the other route. Buto will probably win unless a bunch of dirt is dug up on him. Most folks around here hate Trump so bad they will vote any Democrat in. Beto, the punk rock dude... wow, it goes to show some people do no research when voting. He is betting on folks seeing Beto and voting a heritage or culture. Very unfortunate. Unfortunately, we live in a society of many ignorant folks. Are you serious!? Trump voters are actually saying they’re going to vote for this communist!? 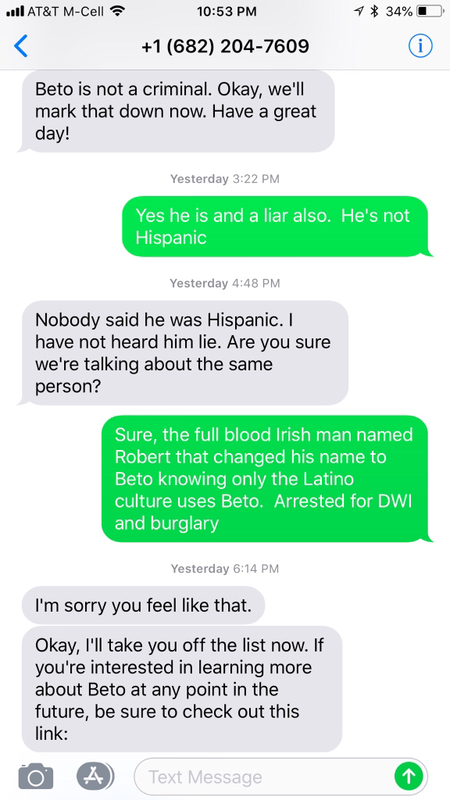 But then again I’m just an Irish mutt, maybe Beto is a common name in the old country! I've seen some. I've seen comments about how they couldn't vote for a guy that let Trump make fun of his wife, couldn't vote for "lying Ted", etc.... Makes no sense to me either. Hopefully there aren't too many of those folks. I've also seen a lot of teachers who have always been conservatives, but are now all fired up and mad about having their health insurance premiums go up and everything who are now on the Beto train for some reason. Beto apparently talks about how TRS should treat teachers better at all of his speeches, and they lap it up. But he's a US Representative that's running for a US Senate seat. TRS is a state legislature deal, not federal. Beto can't do anything about it, even if he wins. But a bunch of teachers are loving him because he says what they want to hear right now. Makes no sense at all. Seems like people vote with their heart and not their head. Democrats win when they can avoid being pressed on their stances. Lucky for them most of the media doesn’t ask them tough questions. Will never vote for socialism. I canceled a service contract I have with a local computer company today when I saw the Beto signs lined up in front of their office. I stopped in and asked about the signs and they were so happy to tell me about "their" guy. I then politely told them I was there to close out my service contract and would do business elsewhere. I know I'm a small fish but they were shocked and I really liked their work. No longer. I'm not saying don't go out and vote, but Ted got more votes in the primaries than all of the Dems combined, I just don't see him losing. I'll be voting, we need a landslide to stop this "Texas is turning blue" nonsense. I’ll say this, the Beto folks are hustling. How many Cruz texts have y’all gotten? How many signs have you seen? My answer is 0/0. We better turn out or Cruz is done. As far as I'm concerned is if you stay home and not vote for Cruz, you've voted to the liberal left. Hate him all you want, if you want progress to continue forward you'll get off your ARSE and vote Cruz. No question - on both counts. Once the TV ads start and the truth about Beto starts to get out to all the people who aren't currently paying attention, hopefully that'll help too. For sure, and most of them can't articulate any sound position on issues other than "I like what he/she is saying"
The worst part is even if these two debated, Beto could get/would get, absolutely crushed and his supporters wouldn’t care. That is the truth. I asked a guy the other day about that beto sticker on his car and he said I dont care what he is, as long as it aint a Republican. I never said anything back, but I realize the mentality in this area would vote for socialism and not even care. That’s “voting” with your wallet. Good for you! Had a similar conversation recently. Asked the guy what are some of beto's positions and he said anything anti-trump is all that matters. Later I was looking at something on my phone when he walked up and I made a comment about getting more money in my paycheck. He was like yeah they lowered taxes recently. I was like wow that's awesome and he replied with yea it's great, I never thought the irs would do something like that. When I said that was the Republican Congress and Trump he freaked. He didn't think they controlled that and wanted to argue that it was the IRS who did it. I started laughing and told him to look it up. He then said they can have it back he didn't want anything from Trump. We should all text that guy (or gal. Or whatever it wants to known as). I say we compile a list of the phone numbers these texts are coming from and bombard them with "Vote for Ted Cruz" texts. Lots of California and New York liberal money being spent in Texas to elect this clown. Go vote and take a friend. X2, drops mic and walks off. I had a very similar text convo with one of their volunteers early this year. I told them “I was a gun toting, Jesus loving, registered conservative. Don’t ever text me again.” Needless to say, they didn’t text me or my wife again. Cruz seems to be taking the back seat... he better get to work. Cruz WILL lose to this guy if he doesnt knock off the PC camapaign **** and START Exposing this beto jackwagon for what he and his family are. I suspect the Cruz team is waiting to unleash all the skeletons closer to the election. Causing the Krooked Beto team to scramble with rebuttals. I haven't checked lately but Beto also has more campaign dollars than Cruz causing Cruz to be more frugal. I would bet it will be close this time around, lots of Beto bumper stickers and signs. Lot of the young folks or hispanics dont want a republican, Trump has got them hating republicans real bad. I hear it a lot.